A new parking lot will provide more than 800 new commuter parking spaces this fall. (April 16, 2018) -- As The University of Texas at San Antonio (UTSA) grows so does the need for more on-campus parking. When classes begin for the Fall 2018 semester, commuter students will have hundreds more spaces to choose from on the UTSA Main Campus. Campus Services is managing the construction of the new East Campus Lot 3. It will be located near Valero Way, adjoining the existing East Campus Lots. The location will add more than 800 commuter parking spaces, with easy access to The ‘Runner shuttle service. The new lot is designed to reduce parking and traffic congestion at peak times, while also providing necessary infrastructure for a growing campus. Additionally, The ‘Runner buses will move from their current home in Brackenridge Lot 2 (BK2) to a newly constructed bus depot near the East Campus Lots. With an anticipated completion during the fall semester, this move will add approximately 80 commuter parking spaces in BK2, one of the most popular parking lots due to its proximity to the center of campus. To offset the environmental impact created by construction, and as part of a citywide effort to increase plant life, UTSA will receive 75 trees to plant throughout campus in strategic locations, including near East Campus Lot 3; an additional 225 trees will be planted throughout San Antonio. Mulch from the construction area will be relocated throughout Main Campus in an effort to reuse the material along existing trails. Native plants will be included in the landscaping to add natural beauty around the new lot. The UTSA Office of Facilities staff helped maintain the natural landscape by creating “no mow” zones across campus to protect wildflowers and native plants during the growing season. 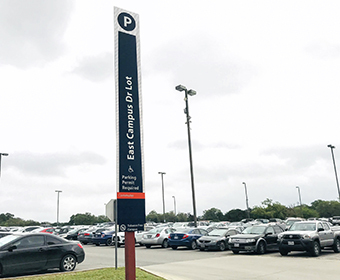 UTSA students, faculty and staff can also purchase parking permits for the 2018-19 academic year through MyParking, and have the option to pay later. Students can add the cost to tuition and fees. Employees can choose payroll deduction. Permits begin mailing on August 1. Another option is to go green and start a carpool. Use the Alamo Area Council of Government’s rideshare tools to find carpool friends, then register a carpool with Campus Services. Carpool members share use of the primary permit holder’s parking permit when riding together. On days when the carpoolers need to drive to campus separately, non-primary permit holders in the carpool can still park using one of five scratch-off permits allowed during the academic year. Learn about UTSA Campus Services.